Buddhas are perhaps the most popular statue used in Asian gardens for his image represents awakening. Not all Buddha statues are representations of the original Buddha however. They may be standing, but most often are in a seated meditation position. They almost always are shown with a hand gesture or mudra which is a symbol of divine manifestation. The Dhyana mudra here is the gesture of spiritual perfection and meditation. It is said this is the mudra the Buddha assumed during his enlightenment under the sacred Bodhi tree. 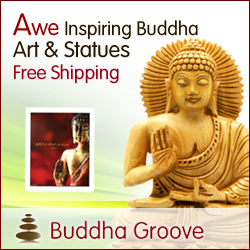 Buddha statues can set the mood of a garden, act as an altar or to provide a sense of an Asian inspired flavor to a garden whether you are a practicing Buddhist or not. Like all statuary and sculpture, the piece must be situated so that it is in scale and proportion. Most statues or people and animals are smaller scale than the life sized counterpart and often look quite diminutive in most settings. To help offset this, you can opt to buy the largest statue available if costs allow, or depending on the statuary, placing it on a pedestal to elevate it helps quite a bit, especially meditating Buddhas. A stupa is a form of Buddhist architecture and are powerful agents for spiritual transformation. This is the Amitabha Stupa of Sedona, Arizona which both symbolizes and embodies enlightened mind. Buddha Amitabha -- the Buddha of Limitless Light is set into this stupa. His mantra is "Om Ah Mi De Wa Hri". Built by Tulku Sang-nang Rinpoche under the direction of Jetsumna Ahkon Lhamo, Spiritual Director of Kunzang Palyul Choling Palyul. This stupa is open to the public and provides a sanctuary and sacred space for anyone who wants to visit. There is much complexity that goes into the building of stupas and most of its sacred power is hidden inside the structure yet emanates beyond its concrete walls. Someone who was a Buddhist or deeply interested in Buddhist teachings and practices could recreate one in their own garden just as having a Buddha statue in your yard does not mean you worship Buddha the person, but the embodiment of his teachings. What is a Spiritual Garden?